Direct Mail Advertising Services-Beasley Direct and Online Marketing, Inc.
Breakthrough Software was a new e-commerce content management platform. 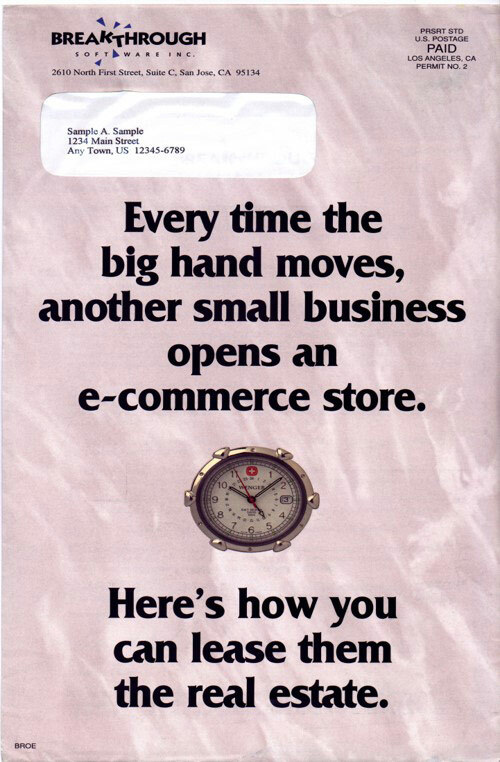 This direct mail campaign was directed to Value Added Resellers (VARs) who were building a swarm of e-commerce websites during the dot-com rush to go online. We offered a beautiful Swiss Army watch as an offer/reward for viewing a demo. We followed up the email campaign with tele-prospecting to the responders and non-responders. This added another 15% of prospects who were scheduled to view the demo. Are your direct mail marketing campaigns not getting responses from a targeted audience? Contact and speak with one of our seasoned direct mail advertising services experts today.